For the most part I have pretty great skin. I can count on one hand the pimples I have had in my life time and I am not overly dry or oily. However, my cheeks and nose have redness that won't go away and gets worse from sun, sweat, heat, etc. It's always bothered me but until about six months ago I hadn't looked into solutions. I spent a few weeks researching skin care products for redness and created my own regime. I have been using all these products for about six months now and while I don't see a huge difference in my redness, I do notice it doesn't flare up as often, which is better than nothing. Check out my reasons as to why I love each product below. 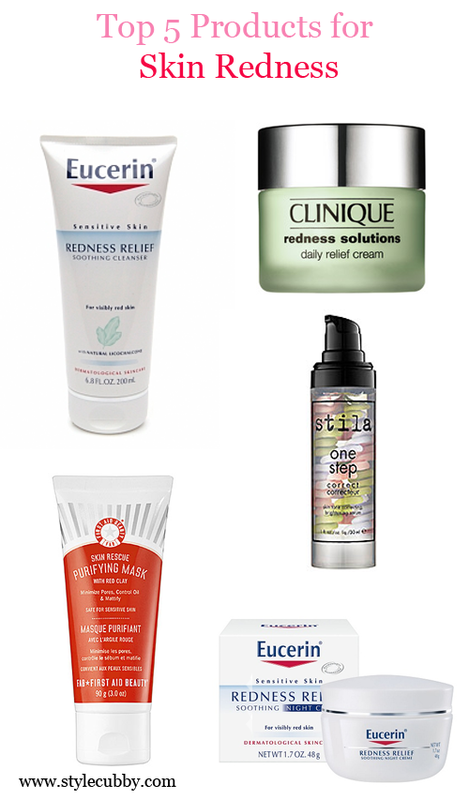 Eucerin Redness Relief Soothing Cleanser: I love the entire Eucerin Redness Relief line and especially this cleanser. It actually is very similar to the Fresh Soy Face Cleanser which I used to use and love. It is almost the exact same consistency and about 1/3 the price! While using this, I find my face is far less irritated and the formula does not add any redness to my skin. Clinique Redness Solutions Daily Relief Cream: I use this and the Eucerin Daily Lotion. I like to have both since the Eucerin has SPF and the Clinique does not. I have noticed since using these lotions that my face does not become as red in certain situations, such as heat. Where as before, it would become very red all over, I find now the redness is less noticeable. I use this every morning after I shower and before I put anything else on my face. Stila One Step Correct: I was recommended this product by a Sephora Employee as a primer that would help with redness. It has three different colors that mix together when you pump it out and each color is supposed to help with a different problem. I used up my entire sample (which took about 2 months!) and I am planning to buy the full size. I have tested it by putting it on one side of my face and not the other and I can definitely tell a difference. I also feel this helps my make up stay on longer, which is always a plus! Eucerin Redness Relief Soothing Night Cream: Using this night cream is one of my favorite parts of the day. It is very thick and feels so luxurious on the skin. Even though it's from the drugstore, the quality of this product is much more that what you would expect. It makes my skin feel cool and so soft to the touch. I use this after I have taken all my makeup off and before I get into bed. First Aid Beauty Skin Rescue Purifying Mask with Red Clay: I have heard great thing about the whole First Aid Beauty product line but this is the only product I have used. I don't notice that it necessarily reduces redness but it does noticeably make my skin feel and look better after just one use. The brand does have an Anti-Redness Serum which intrigues me but I have yet to try!